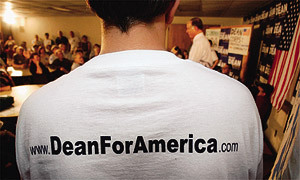 There's at least one guy who seems to have got hold of this blog-social-network thingy: Howard Dean, one of the democrat candidates for the 2004 presidentials. He's got his own campaign blog, and uses MeetUp to organize meetings with supporters, and to make them work for the campaign. He gets donations online, and he's managed to raise seven million dollars (that's 4.99 euros, right? :-)) . Besides, he seems to be the only candidate to be openly anti-war. He'll be probably beaten, but his campaign organizers will get rich doing the same for other candidates all over the country. I only hope somebody in Spain gets it, not because I want candidates to be on me asking for money (which is illegal anyways under Spanish law), but because, at least, that will mean that they have a grasp of new technologies. Lots of people have also found this link... some think that it might make politics more participative... I sincerely doubt it. It's just a way of raising money faster. But it's cool, anyways. There are other interesting polibog initiatives, like WatchBlog: «WatchBlog is a multiple-editor weblog broken up into three major political affiliations, each with its own blog: the Democrats, the Republicans and the Third Party». Thanks for the link. It seems to be the work of Cameron Barrett, right?